We get many e-mails from people who have found a scrip coin and want to know its value. We are not experts on coal scrip, but we've noticed that 1 cent, 5 cent and 10 cent scrip typically sells for a few dollars on eBay. The ones that seem to be more valuable are the higher values like $1.00 and $5.00. 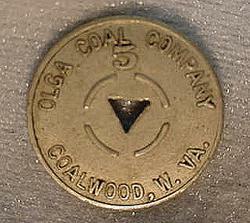 Carter Coal and Olga Coal used a bunch of manufacturers to make their scrip. It's possible some scrip is rare and therefore worth more. Quite frankly, we don't have any idea. If you want to ask an expert, you might want to talk to a scrip dealer. There are lots of them. Just go to Google.com and search for 'coal scrip'. 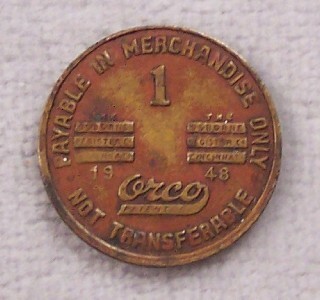 Front and back of a brass 5/8" one-cent scrip coin from Olga Coal Comapny..
Front and back of a $1.00 company scrip coin from Olga Coal Company. 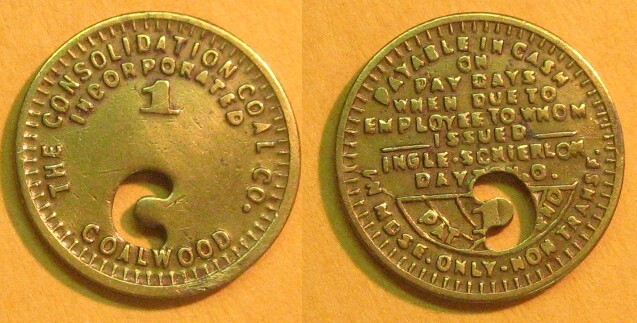 Front and back of a 5 cent company scrip coin from Olga Coal Company. 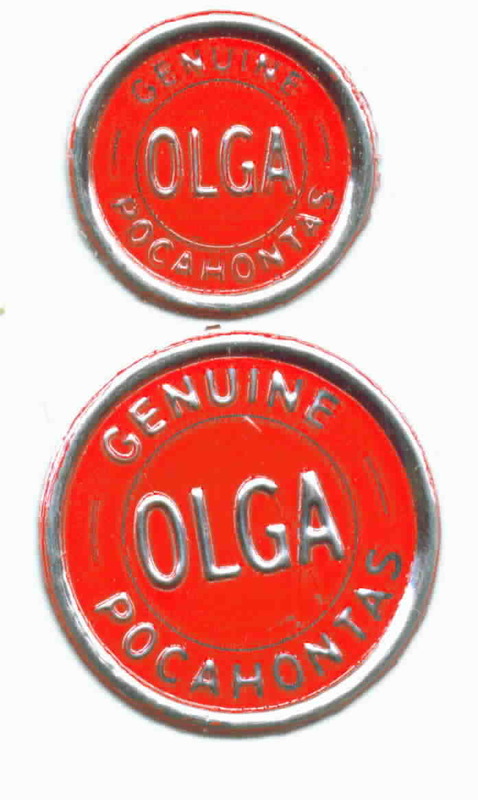 Olga Coal Company $5.00 company scrip. "Payable in cash on pay days when due to employee to whom issued. Caretta & Coalwood, West Virginia. May have also been used at Other Carter Operations. 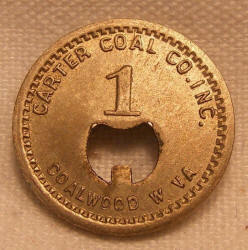 Coal scatter tags were widely used between the 1930s and 1950s to build brand loyalty among consumers. 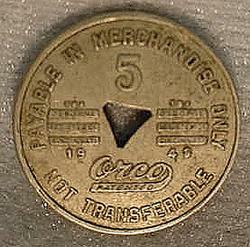 They were small foil or cardboard disks that were scattered into railcar or truck shipments of coal. 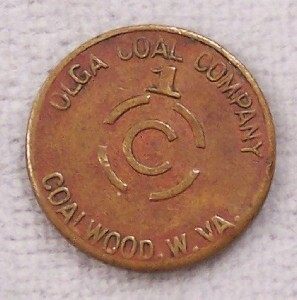 The colorful tags allowed customers to recognize their favorite coal.